The Adventures of Salt and Soap at Grand Canyon is the true story of two puppies who wandered into the Grand Canyon and experienced great adventures—multiple rim-to-river hikes, a river trip and a helicopter ride—while ultimately snuggling their way into park rangers’ hearts. 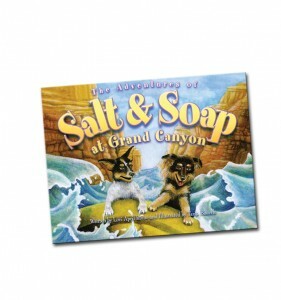 Salt and Soap didn’t know they weren’t allowed below the rim of the Grand Canyon—they were just puppies! Their curiosity and love of human companionship carried them through rugged hikes, riverside camping in a violent thunderstorm, the unpredictable rapids of the mighty Colorado River, ranger patrols at Phantom Ranch at the bottom of the canyon, a harrowing helicopter ride back to the rim, and a new life on the South Rim of Grand Canyon National Park. Told with compassion and a sense of wonder by the park ranger who adopted the pups, this one-of-a-kind canine adventure tale reveals the kindness of strangers, the ruggedness of the Grand Canyon, and the joy two wiggly, perpetually happy puppies can bring to everyone they encounter.